Stephen Hood, a former Yahoo employee, says that Yahoo developed an interface similar to Google Instant 5 years ago. 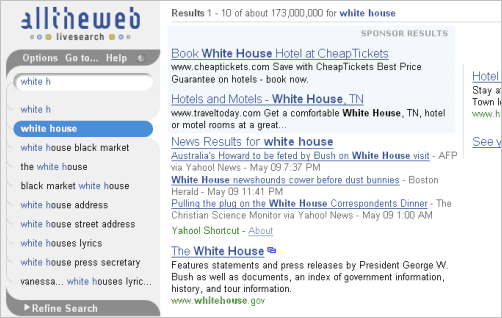 It was called LiveSearch and it was launched as an experimental interface for AllTheWeb.com. You have to remember that, at the time, Yahoo's search business was doing just well enough that there was very little institutional appetite for product risk. As a result, "big" or disruptive ideas were too often left to whither on the vine. By focusing on the local maximum, Yahoo unwittingly traded innovation for incremental optimization. LiveSearch was thus relegated to a tiny test bucket of users who didn't actually use Yahoo's search product (or any modern search engine). Usage data from this flawed test was used to internally evaluate its success in comparison to the model it was actually trying to disrupt. Lacking high-level support for its larger vision and starved for resources, LiveSearch was understandably put out to pasture. "Livesearch has that uncanny knack of figuring out exactly what is on my mind. As soon as I start to type a query, Livesearch suggests the right query and shows me the results page before I even press a search button. For example, I wanted to look for 'mission impossible 3'. Just as I finished typing 'mission', Livesearch is already recommending 'mission impossible 3' as the search, and then instantaneously shows me the results page." Stephen thinks that Google "still has the organizational courage to challenge its own preconceptions" and that's the reason why it can launch features like Google Instant, which change "a user interaction model that's been largely unchallenged for years". When Google changes the interface of a product, many people say: "If it ain't broke, don't fix it!". Fortunately for Google, the company has never followed this principle. As Colin Powell said, "'If it ain't broke, don't fix it' is the slogan of the complacent, the arrogant or the scared. It's an excuse for inaction, a call to non-arms." It is really a cool feature, technology changes future. Yahoo was a little ahead of its time, maybe people weren't ready for it. Too bad it didn't take off. "alltheweb" as I recall was a search aggregator launched about the same time as Dogpile. Is it conceivable that a "Google Aggregator" might be launched? Or would the corporate lawyers be pulling out their hair over that possibility? It seems Google and Bing are the only players left standing, Ask being a minor market share player, and switching between Bing and Google would be forestalled if either service launched an aggregator including the other. The user profiling could be tracked to see which hit list priorities were most utilized, and users could be profiled as Bingers or Googlers, with an aggregation service using variable weightings keyed to past service results. I use Google by habit. I guess many do. However, at times recently Google's returned listings of secondary news aggregation stuff, not original hits atop the list, and Bing does not - as much - so I do shift between services. With Yahoo going with Bing now, it seems user service should trump corporate battleground feelings and MS and Google could allow one another to aggregate without going into Ellison-Oracle file-the-papers mode. The Europeans might scream about market concentration, but what search engine innovations have they offered to compete first before screaming? Colin Powell said, "'If it ain't broke, don't fix it' is the slogan of the complacent, the arrogant or the scared. It's an excuse for inaction, a call to non-arms." Several Billion dollars later and thousands dead yeah, sure, this policy woks. Instant search - the new crap.